By Josh Bancroft, senior analyst, DC and enterprise SDN, Networked Services, IHS Markit. VMware and Cisco acquired SD-WAN start-ups Velocloud and Viptela, respectively in 2018 which enabled them to lead this market. According to a new Dell’Oro Group report, the top seven telecom equipment makers as of 3Q 2018 are: Huawei, Nokia, Ericsson, Cisco, ZTE, Ciena, and Samsung. Huawei has captured a 29 percent share of the global telecom equipment market, increasing its market share by 8 percentage points since 2013. Huawei’s revenue share improved by two percentage points of market share annually in each of the past five years. That’s despite huge challenges in the U.S., UK, Australia and some European telecom markets due to security and backdoor issues. During the same time period, Ericsson’s and Nokia’s market share declined about one percentage point annually on average until 2018 when both vendor held their market share flat. ZTE’s share, which had typically been at 10 percent, dropped two percentage points in 2018 due to the U.S. ban that caused the company to shut down portions of its business during the second quarter. Following three years of decline, the overall telecom equipment market grew 1 percent year-over-year in 2018. The positive turn in the year was due to higher demand for Broadband Access, Optical Transport, Microwave, and Mobile RAN. The remaining equipment—Carrier IP Telephony, Wireless Packet Core, SP Router and Carrier Ethernet Switch—declined in the year. The two largest equipment markets in the year were Mobile RAN and Optical Transport. The worldwide Mobile RAN market surprised on the upside and performed better than expected in 2018. In addition to the strong focus on LTE and LTE-Advanced, the shift toward 5G NR (3GPP Release 15 New Radio – Non Stand Alone) continued to accelerate throughout the year. The worldwide Optical Transport market continued to expand for a fourth consecutive year driven by strong sales of DWDM equipment in China and to large Internet content providers for data center interconnect (DCI). According to TelecomLead.com estimates, Huawei generated revenue of around $38 billion from carrier business, $10 billion from enterprises and $52 billion from phones and other devices — in 2018. Huawei said in December 2018 that it expects total revenue to increase 21 percent to $109 billion in 2018. Nokia Networks business revenue was 20.121 billion euro (–2 percent) or $22.82 billion last year. Ericsson’s revenue was SEK 210.8 billion (+3 percent) or $22.58 billion in 2018. The latest GSMA report indicates that mobile operator CAPEX reached $161 billion in 2018 and is forecast to be $161 in 2019 and $160 billion in 2020. 5G related CAPEX will grow to $123 billion in 52 markets in 2020 from $81 billion in 19 markets in 2019 and $41 billion in two markets in 2018. Mobile operators will invest around $480 billion worldwide between 2018 and 2020 in mobile CAPEX. Their investment focus will be 3G, 4G, 5G roll outs; and network optimization; capabilities beyond core telco. 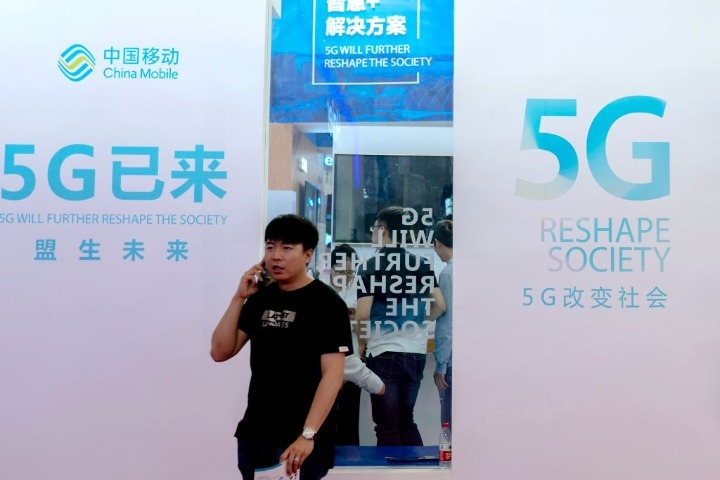 5G is on track to account for 15 per cent of global mobile connections by 2025, as the number of 5G network launches and compatible devices ramps up this year, according to a new GSMA report. 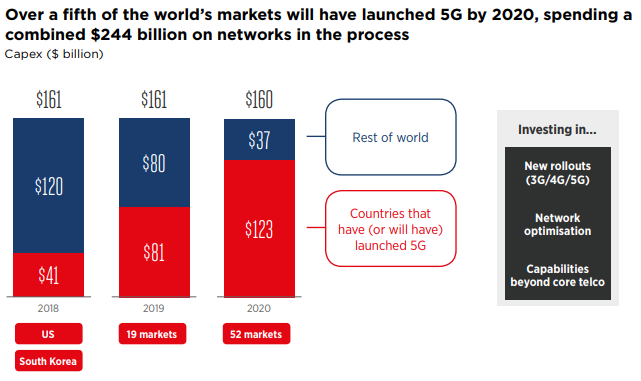 The 2019 global edition of the GSMA’s flagship Mobile Economy report series reveals that a further 16 major markets worldwide will switch on commercial 5G networks this year, following on from the first 5G launches in South Korea and the US in 2018. It is calculated that mobile operators worldwide are currently investing around $160 billion per year (CAPEX) on expanding and upgrading their networks, despite regulatory and competitive pressures. According to Telecomlead.com, Huawei has signed 30 plus 5G commercial contracts. Huawei has delivered over 40,000 5G base stations for commercial use. Huawei has 50 plus 5G engagements with customers. Nokia has 20 plus 5G contracts, and almost 100 5G engagements with customers. Samsung shipped 36,000 5G base stations – mainly to operators in the US and Korea — in 2018. 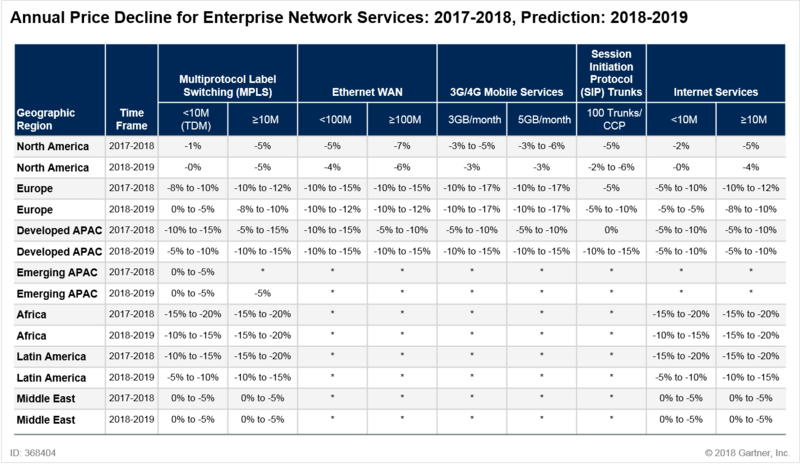 According to Dave Bolen of Dell’Oro Group, Cisco, Ericsson, Huawei, Nokia, and ZTE are the top-five wireless/ mobile packet core infrastructure vendors. At MWC 2019 in Barcelona, each put on a spectacular show with massive stands demonstrating its end-to-end technology prowess empowering 5G use cases, all enabled with their respective cloud-native cores. Their stands were packed with customers and potential customers leading to thousands of meetings. Each vendor had its share of press releases with 5G deals around the globe that are too numerous to name here. Links to the happenings at MWC19 from each of the top-five vendors may be found at Cisco, Ericsson, Huawei, Nokia, and ZTE. Network transformation is well on its way with the evolution of SDN and SD-WAN, leading to flexible network architectures taking hold from the cloud to the enterprise edge, powered by intelligent automation. Increasing use of streaming analytics and pervasive visibility, enhanced by ML and AI, is creating a next-generation, agile network that self-remediates performance issues and proactively responds to security threats. The result will be greater operational efficiencies, improved user experience, and verified SLAs that ensure delivery of meaningful business outcomes. The network is a foundation layer for enabling secure, scalable and efficient use of Cloud, Edge and IoT Applications. Please see comments below this post for Alan’s thoughts on Rohit’s presentation at IDC Directions 2019. “Self-driving” Networks are now needed to be Automated, Orchestrated and Optimized Network System. Traditional networks break down as they scale (get larger) and increase workloads, making automation essential in future networks, e.g. 5G. Network automation is a methodology in which software automatically configures, provisions, manages and tests network devices. It is used by enterprises and service providers to improve efficiency and reduce human error and operating expenses. Network automation tools support functions ranging from basic network mapping and device discovery, to more complex workflows like network configuration management and the provisioning of virtual network resources. Network automation also plays a key role in software-defined networking, network virtualization and network orchestration, enabling automated provisioning of virtual network tenants and functions, such as virtual load balancing. IDC defines DX as the continuous process by which enterprises adapt to or drive disruptive changes in their operations, customers, and markets. Today, many businesses are implementing DX without success, and some fail entirely. In part, this is due to pervasive technology shifts that are changing how organizations transact business, address customer expectations, operate and secure products and services, and compete in the marketplace. IDC maintains that virtualization has matured from simple partitioning and encapsulation to leveraging the mobility of virtual machines to improve management and operations of IT environments. Virtualization 2.0 includes a host of new use cases that range from high availability and disaster recovery to hosted clients and true utility computing. Note that this information was not discussed by Rohit, but rather assumed to be known by the session attendees. Driven by cloud IT service adoption, the market for global enterprise network services is undergoing a generational shift in both technologies and the provider landscape. Infrastructure and operations leaders must adapt their network sourcing approaches to reflect this transformation. The market for global network services continues its rapid evolution. In response to enterprise demand for WANs that can support cloud IT delivery and achieve much higher levels of agility, network service providers (NSPs) have been deploying a range of new software-based networking services. They are also changing their business models to allow for more flexible sourcing. This Magic Quadrant focuses on these transformational technologies and/or approaches that deliver on the future needs of the enterprise, rather than simply concentrating on legacy services. However, delivering a consistent set of service features and user experiences across all these elements on a global basis remains a challenge that requires scale and operational maturity. WAN transport services, used to form hybrid WANs and underpin managed software-defined WAN (SD-WAN) services — These include MPLS, Ethernet services and internet services, including dedicated internet access (DIA), broadband and cellular. Carrier-based cloud interconnect — This refers to direct MPLS, internet and/or Ethernet connections to leading providers of cloud services, including infrastructure as a service (IaaS), platform as a service (PaaS) and software as a Service (SaaS). These services improve the performance, availability and security of connectivity to critical cloud services, compared with generic public internet access. The option to insert network functions, such as firewalling and WAN optimization (which are often virtualized), into these connections is increasingly common. 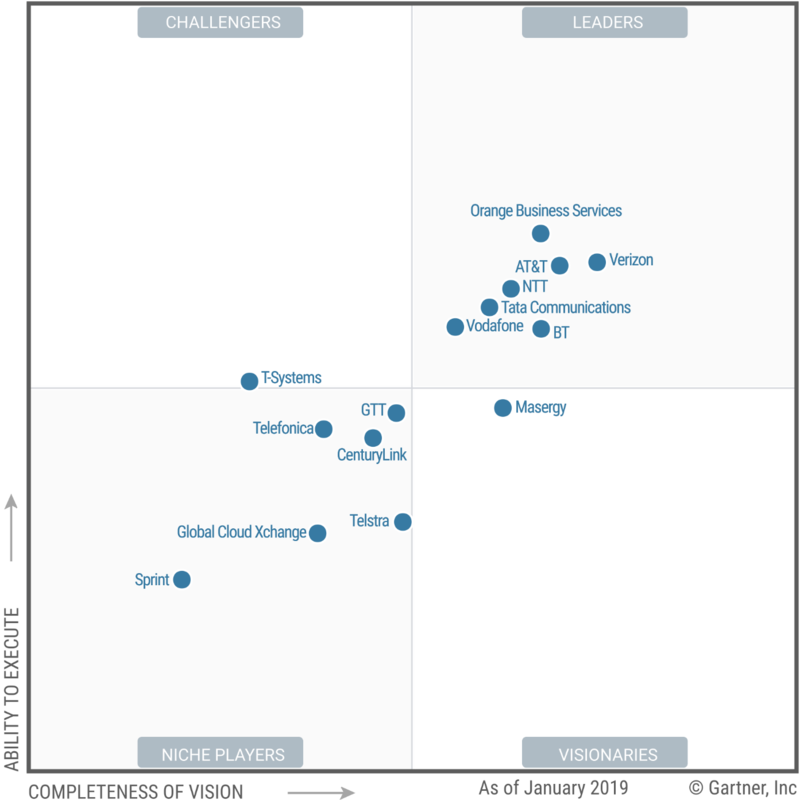 Managed software-defined WAN (SD-WAN) services — While some enterprises are renewing their existing MPLS or hybrid WANs, virtually all new managed global network deployments seen by Gartner in 2018 were managed SD-WAN networks, a trend we expect to see continue through 2019 and beyond. These services are based on edge devices with zero-touch configuration, able to dynamically route traffic over different links based on policies under central policy management control (see “Technology Insight for Software-Defined WAN [SD-WAN]”). SD-WAN improves WAN agility by allowing easier and faster deployment of new sites, flexibility in the link types used, and simplified addition of new applications to the network. In addition, SD-WAN services typically provide significantly enhanced levels of application visibility compared to traditional managed router services. Network on-demand services — Network on-demand services from NSPs enable enterprises to make real-time changes to access/port bandwidth, change the WAN service types delivered over a network port and, in some cases, even add and remove endpoints, such as connections to cloud providers all under software control. They are controlled by the enterprise, via the provider’s web portal or APIs. Many providers are using software-defined networking (SDN) to deliver this functionality. 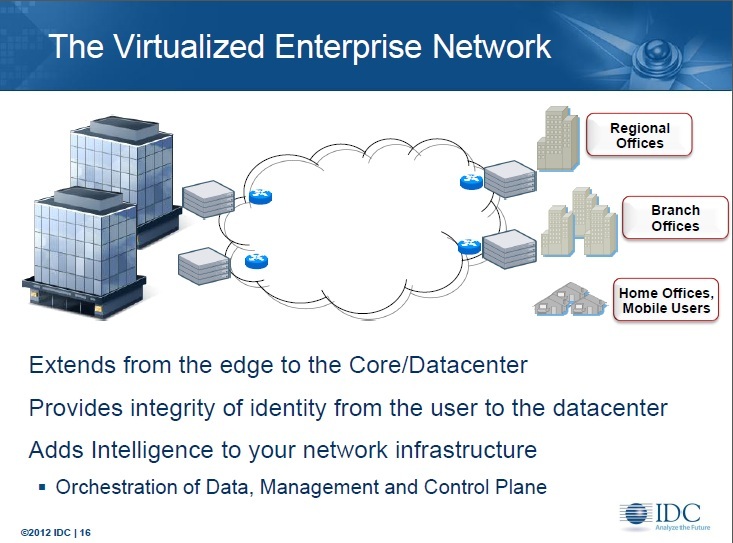 Network function virtualization (NFV) services — This functionality is the replacement for purpose-built hardware devices, such as routers, security devices or WAN optimizers, with software running on industry-standard hardware equipment (see “Network Function Virtualization Will Enable Greater WAN Agility and Flexibility”). It can be run in virtual customer premises equipment (vCPE), which consists of on-site x86-based servers, supporting multiple virtualized network functions. Alternatively, some functions can run NFV service nodes, located in the provider’s network; although, in this case, some form of on-premises device will still be needed. NFV allows network functions to be activated on demand and consumed on an “as a service” basis, seeking to improve both the agility and cost-effectiveness of the enterprise WAN. In the past 12 months, Gartner has observed continued evolution of enterprise requirements and buying criteria for global networks. Enterprises are focusing on increasing the agility of their networks and on services that can enable their adoption of cloud IT delivery and eventual adoption of the Internet of Things (IoT). This is leading to most new global networks being based on SD-WAN and making greater use of the internet as a primary WAN transport. Additionally, enterprises are more willing to utilize smaller providers and innovative services consumed on an as-a-service basis. This places less emphasis on larger providers, network scale and the availability of large numbers of provider staff to deliver customized capabilities to address site- or application-specific requirements. Network on-demand services are gaining in popularity, not to reduce costs by varying WAN bandwidth over the course of the day or week, but rather to dynamically adjust the capacity of different network services (e.g., Shrink MPLS and grow internet access as SD-WAN is rolled out). This allows enterprises to accommodate new applications and even create connections to new destinations, such as additional cloud providers, on demand, potentially allowing for dynamic load balancing of cloud providers and cloud performance optimization. However, these offerings are in their infancy in terms of functionality and coverage. While delivering against a strong technological roadmap is important, it must be combined with good operational performance to deliver and sustain these services. Some service providers have been struggling to deliver the new capabilities they are offering with the levels of quality enterprises require. To strengthen the focus of this research on these key trends and capabilities, Gartner is no longer evaluating SIP trunk services, managed LANs or wireless LANs (WLANs). SIP trunk services will be covered in a separate Market Guide. The inclusion and exclusion criteria for this year’s Magic Quadrant, although similar to prior years, have been adjusted to reflect these trends.